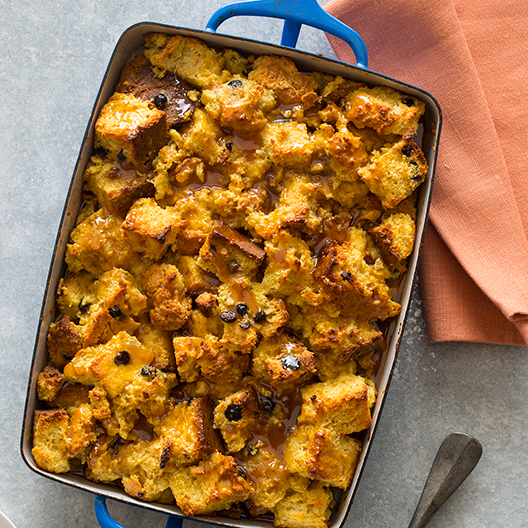 A recipe for Irish Soda Bread Pudding made with leftover Irish Soda Bread. Dovetailing tip: Use the leftover Soda Bread from Meal 1. Cube the bread and toast it in a 400° oven for 5 minutes. 1. Preheat oven to 375?F. 2. Lightly grease a 9”x13” baking dish and set aside. 3. Place eggs, cream, orange zest, juice, sugar, cinnamon, cardamom, and salt in a mixing bowl and whisk together until fully combined. 4. Place cubes of bread into another mixing bowl and pour egg mixture over. Fold together until well combined. 5. Pour mixture into the prepared baking dish and allow mixture to sit for 30 minutes. 6. Place dish in the oven and bake for 30 to 40 minutes or until mixture has cooked through and is toasted on top, but soft and slightly custard-like in the center. 7. Top with 2/3 of the caramel topping, allow the pudding to cool for 10-15 minutes and serve with extra sauce.